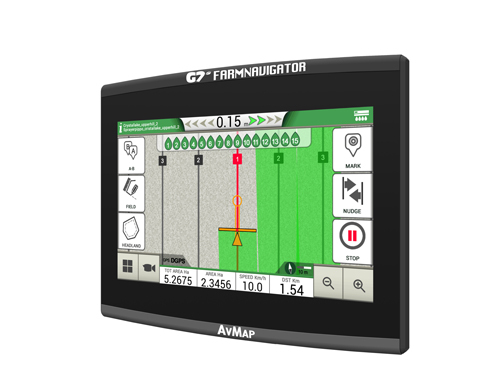 February 1st, 2016: AvMap, the Italian manufacturer of GPS solutions since 1994, presents G7 Ezy FARMNAVIGATOR, an affordable and easy-to-use GPS that can be adopted by farms of any size. G7 Ezy Farmnavigator is ideal for basic operation such as mapping, weeding, fertilizing, and phytosanitary treatments. The software is farmer-friendly, with a very intuitive interface and large buttons for each function. In the field view you can keep an eye on all the most important data and everything is within reach thanks to the collapsible menus. You can use multiple finger gestures on the Multi-touch display to scroll menus or to zoom in and out the field view. • G7 Ezy Farmnavigator comes with a simplified Graphic User Interface to help the operator easily choose the right settings, follow the guidelines and manage data. • The Advanced Parallel Guidance features now adaptive contour guidelines: the parallel lines adapts dynamically as you drive and avoid obstacles. • You can also choose Pivot guidelines. • The Advanced Section Control lets you close or open manually a section from the G7 Ezy display forcing the automatic control. • An improved data management: for each job, G7 Ezy saves farmer, activity, field, implements used, products used, worked area, total time etc. • The headland management optimizes spraying and seeding operations especially for irregular and triangular areas. The headland function can be used with A-B parallel guidelines, identical contour curves and adaptive contour guidelines, and it allows working the headland at the end, avoiding unnecessary overlaps. G7 Ezy Farmnavigator features an incredibly bright 7” sun-light readable display with 16 million colours. The bonded LCD reduces the reflections, increases the contrast ratio, and eliminates condensation. Dust and water proof, it is suitable for use on tractors without a cab. The display is covered edge to edge with hard glass that can be easily cleaned from dust in one swipe. G7 Ezy Farmnavigator is powerful and tough, yet weighs only 640 g. The install takes only few minutes: place the Farmnavigator on the bracket, plug the power cable and connect the external antenna into the DB9 serial connector. FARMNAVIGATOR can be combined with the new Smart GPS / GNSS receiver that offers GPS and GLONASS concurrent GNSS operation, SBAS tracking for increased position accuracy and 10 Hz Update rate; it is NMEA 0183 compatible and it connects to G7 Ezy with a 4m power cable. You can also choose the other compatible DGPS receivers to fit your precision requirements.